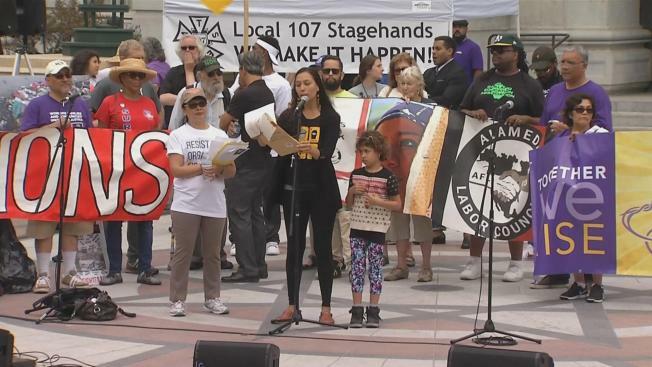 As union members marched in Oakland, San Jose and other Bay Area locations Monday for a $15 national minimum hourly wage, Rep. Barbara Lee, D-Oakland, added her voice to the chorus. Describing the American workforce as "the most productive in world history," the congresswoman said, "I stand with our union brothers and sisters in support of the Fight for $15 nationwide." Lee said women and communities of color bear the brunt of discrimination and institutional barriers holding wages stagnant and that women earn only 77 percent of every dollar paid to white men. "As we pause to commemorate the triumphs of the labor movement, we must never forget the work that remains to give women, communities of color and struggling families a shot at improving their basic living standards and accessing the American dream," Lee said. Union members held a rally at Oakland's Frank Ogawa Plaza. The San Francisco Labor Council, the Alameda Labor Council and the Service Employees International Union took part. Former hedge fund manager turned environmental activist Tom Steyer also was on hand in Oakland preaching that politics matters. "We have to organize, we have to tell the truth, and we have to win elections," he said. Immigrant rights activist Cinthya Munoz Ramos also addressed the crowd, telling them she is undocumented and unafraid to fight the president. "It was you and me that brought about DACA, and whether he ends it or not, we are still here, and we have work to do," she said. In San Jose, members of SEIU Local 521 traveled in caravan to protest at various South Bay locations, then held a Labor Day picnic at the SEIU office on Zanker Road. In Watsonville, SEIU members and the Monterey Bay Central Labor Council marched through Watsonville, stopping at various locations, according to organizers, who said the event focuses on workers' right to unionize. NBC Bay Area's Mark Matthews contributed to this report.